Ch 1 at the beginning of each new color and slip stitch into the last two stitches of the prior row to finish off each color. Once you reach the width you need for your door or window, stuff your draft dodger as outlined above. After you have the stuffing in place, you can close the ends of the draft dodger. 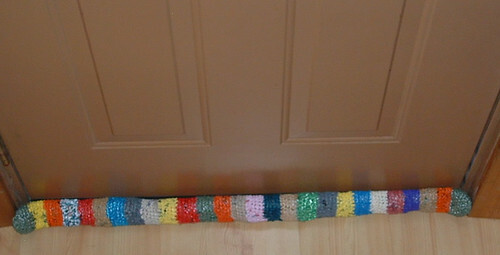 I did this by attaching the same color plarn and working two single crochet stitches together around the opening. After two rounds, cut the plarn and leave a tail for closing off the end. Repeat for the other end of your draft dodger. Another great recycling project. I love making draft dodgers. I’ve made several from recycled clothing and given to people. I’ve even made some for a ladie’s windows that had drafts where the top and bottom sash met. Very colourful – I wonder if there are that many coloured plastic shopping bags in Australia? I’ve never seen them altogether if there are! That one is definitely the great recycled one, I always love recycled materials because it saves our mother nature. I love these. I was wondering if it can be filled with things like dry beans or maybe rice? DC – I do know some people who fill these with dry beans or rice. You just want to be careful not to get the draft dodger wet as the food may mold or smell. When I’ve made draft dodgers from fabric, I stuff them with Kitty litter. It tends to absorb well the moisture you find against windows from condensation.